I originally posted this on udandi, but it is worth a re-post for Lunch It Punch It restaurant week, fast food style! 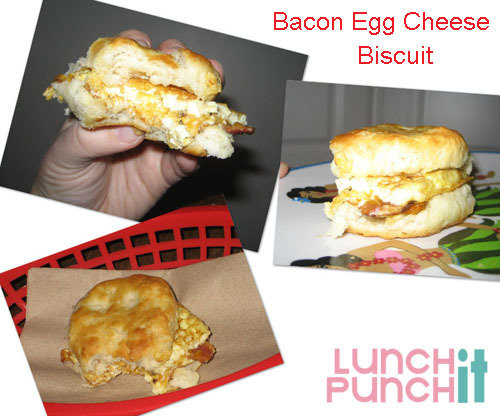 Don’t deny it, every once in a while you want a breakfast biscuit sandwich and you can have it, at home. I buy biscuits I can make in my toaster oven (I can’t live without that appliance) and start making those while in a frying pan I do bacon. Once the bacon is cooked and drained, I pour in my beaten egg and milk (or some prefer half n half) and when it almost done, I sprinkle shredded cheese. Then, I flip it in half an omelet (if using one egg you will want a small pan so it does not spread much). To finish it, cut and place on a warm biscuit that has been cut open like a sandwich bun and enjoy! This looks delish and just like McDonalds’s. Great ideas for a Sunday morning breakfast.